Kahaani begins with a man in a gas mask, experimenting with a seemingly poisonous gaseous liquid, on lab mice. This liquid kills several commuters in the Kolkata Metro. The prologue then concludes with a heavily pregnant Vidya Bagchi (Vidya Balan) landing at the Kolkata International Airport. Vidya Bagchi, who has to get used to being called "Bidya Madam" in the City of Joy, is in search of her missing husband, Arnab (Indraneil Sengupta). He has been missing for over a month - he was apparently a software engineer, on an assignment in the city. She first visits the Kalighat Police Station, to file a report, and befriends Rana (Parambrata Chattopadhyay), a young sub-inspector. Vidya meets with some people who she hopes will give her a clue to her husband's whereabouts, but nobody seems to have heard of him. Slowly, as she trudges around in the heat, with Rana for company, she realises that there is more to her husband than meets the eye. Sujoy Ghosh, along with writer Advaita Kala, has written a script so tight that you can barely breathe with every new layer of suspense that is peeled off. You find yourself feeling overly protective about this woman in a delicate physical condition, as she gets sucked deeper and deeper into a complex web of intrigue and deception. Just when you heave a sigh of relief after one situation, along comes a new complication, and the roller coaster ride begins all over again. The screenplay is near perfect, without a single dull moment to distract you from the screen. Despite the liberal smattering of Bengali, the narration is crystal clear, and flawless. Sujoy Ghosh must have written this story with Vidya Balan in mind, because there is nobody else who could have played the role of a distraught wife more convincingly. Her performance has to be seen to be believed, as she proves, once again, that we do not need leading men with six-pack abs to bring to life a story well-told. Even otherwise, Kahaani is a movie well cast. Parambrata Chattopadhyay is an able supporting actor, well-known for his lead roles in Bengali films. He captures, brilliantly, the angst and the desperation of a man out of his depth in a situation that he cannot control. Nawazuddin Siddiqui and Indraneil Sengupta play their parts well. Kolkata and its people are, of course, the second protagonist in the movie, and the absence of forced clichÃ©s is a welcome relief. The cinematography by Setu (of Taare Zameen Par fame) is gritty and engaging, keeping pace with the tone of the story. The film was shot during the festival of Durga Puja, and the makers have captured the mood beautifully. Production and costume design do not disappoint, either. The guest house, the trams, the narrow streets of the city, the taxis, the Metro, the police station, the pavement - all these otherwise ordinary elements blend seamlessly to create a world of mystery and secrecy. 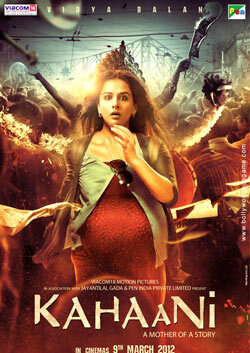 There is no song and dance in Kahaani, thankfully, but Vishal-Shekhar have done a tremendous job with the music. Getting Amitabh Bachchan to sing Rabindranath Tagore's "Ekla Cholo Re" in Bengali and Hindi is a stroke of genius. The background score, too, is commendable. Without further ado, book your tickets for Kahaani, an intellectually stimulating and superbly crafted film, the likes of which Bollywood has not produced in a long time. Sujoy Ghosh may just become the next Satyajit Ray, if he remains consistent in his art of storytelling. fullhyd.com has 700,000+ monthly visits. Tell Hyderabad what you feel about Kahaani!